What can a censored artist do? I watched the Seattle premiere of a play in search of a genre: White Rabbit Red Rabbit By Iranian Nassim Soleimanpour at 18th and Union. Billed as a one-act play for an actor that has never read the script, the show also draws into the performance lots of people in the audience. Soleimanpour, at times, through the actor, speaks in his own voice. When asked near the start to count off, the script/Soleimanpour plays with our understanding of what he has engaged us in by reminding us to count also the actor, and himself. He asks that a seat in the front row be left empty for him to sit in. Soleimanpour like all true artists know he counts. He wrote this play in 2010 in Iran, where it could not be produced. As a conscientious objector to the mandatory military service (something he shares about his life in the play) he could not travel. The play requires minimum props and furniture, several of which are supplied by the audience. Thus when Soleimanpour shared his work via email with producers at Fringe festivals, he had found his outlet. 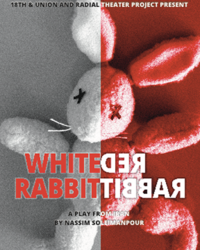 In 2011, White Rabbit Red Rabbit opened at both the Edinburgh Festival and the SummerWorks Festival in Toronto. Without revealing much of the details so as not to spoil it, there is a great deal of audience participation involved. 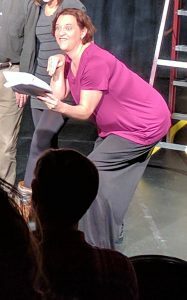 My straw count showed 13 audience members engaged in some active form such as stepping onto the stage with “the actor” as commanded in the script. And three more people offered props when prompted, and one took notes when the script and “the actor” requested. Another took pictures when asked. Disclosure: at this performance I took the notes. Kate Jeager. Photo: David Gassner. Though a one-act performance there were distinct sections. Soleimanpour—via Ms. Jaeger—reflected on the nature of hope in his situation, how cultures create and replicate themselves, and the meaning and importance of owning our choices. You will note at the bottom of this review a list of the performers for the role of the actor. Go see this show in search of a genre. Though it’s been translated into 22 languages and performed thousands of times, due to the unique dynamics of the particular actor you catch, and the particular audience that attends, you are guaranteed a unique one-off experience. White Rabbit Red Rabbit By Nassim Soleimanpour. Various Performers who self-direct. 18th & Union and Radial Theater Project in association with Aurora Nova Productions and Boat Rocker Entertainment. Runtime: 65 minutes with no intermission. 18th and Union, 1406 18th Avenue, Central District. Thurs – Sat at 7:30 PM, Mon 11/14 at 7:30 PM. Tickets: 18thandunion.org/tickets. Runs Nov 3 to Nov 19.